Mary Hufton, the senior member of our club, died at Castle Mount Care Home in April after a short illness. The Club was well represented at her funeral at Egremont Parish Church. Mary was a member right from the start of the Club by Kevin and Jeanette Wilson at Gosforth Public Hall and stayed with it through subsequent moves to the old Seascale Sports Centre (now demolished) to Bootle and to Egremont. 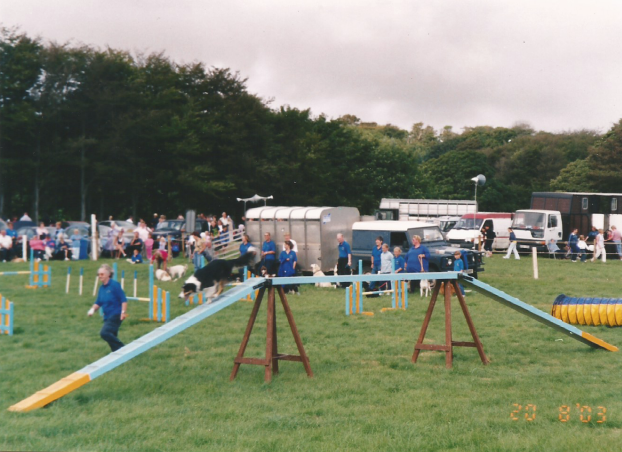 At first the club was focussed on obedience, but soon got into the new sport of agility (with home made equipment) and Mary was involved with this with her dogs Ella and Sam and she soon got into agility competitions and demonstrations. Mary served on the committee for many years, always a moderating influence for some of the wilder ideas that came up, and she was always there collecting class fees. 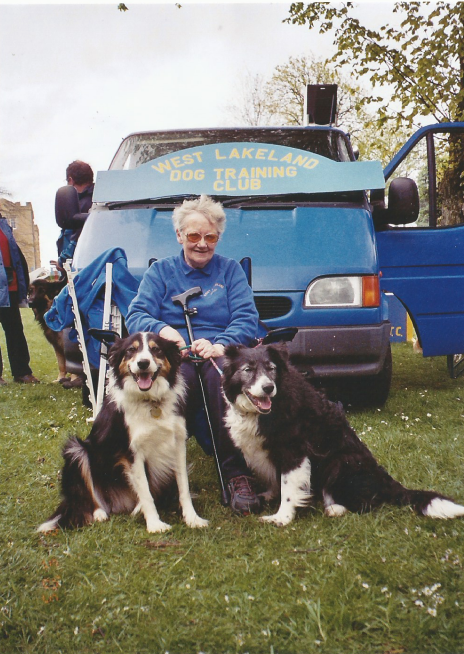 On a personal note, it was through Mary that I got involved with the Club in the 1980’s when I acquired a new dog (also Sam), a collie/lab cross. I joined to do some basic obedience training, but like Mary, I got into agility and several dogs later, I’m still here. Mary appreciated being kept in touch with the Club through our In the Wind newsletter and the last time I saw here she was bright as a button, busy doing a crossword. 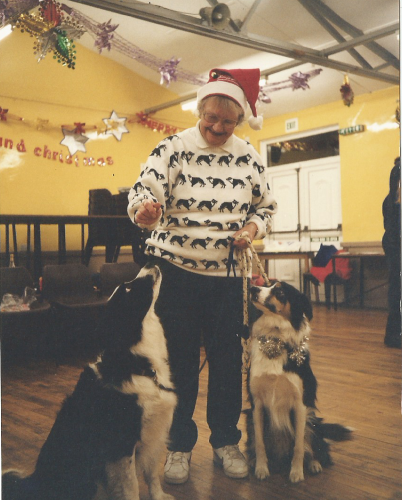 Mary will be remembered as someone who had a love for, and a deep understanding of dogs, and for her contribution to the Club over many years. Mary’s son Ian, has contacted us and kindly supplied us with the photos for this post, he has provided a dog based obituary for Mary. 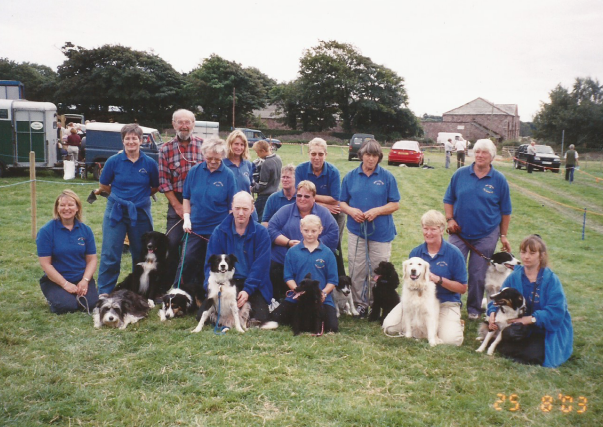 Mary with other club members. Born 1926, grew up in Birmingham in a small terraced house during the WW2 blitz, always wanted a dog but only got one (a rescue dog called Chum) in the early 1950s after getting married, after this had a series of dogs until she had to go into care in 2014. started in WL Dog club in the 1980s with Ross (the first) and did well – this was the time of Kevin Wilson, thereafter became an instructor. Ross (the second) was her final dog. 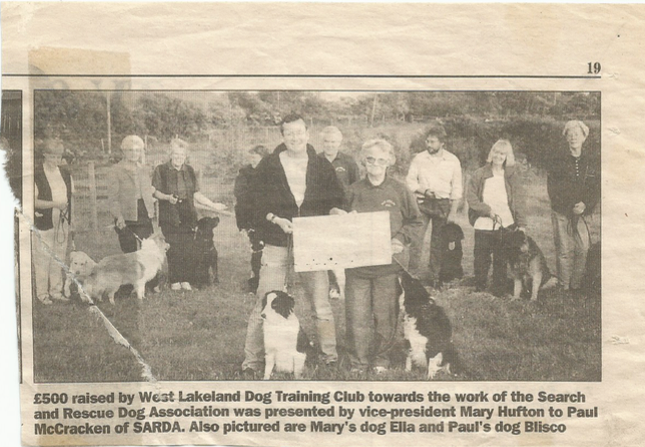 Competed in many competitions in Cumbria, Lancashire and the Isle of Man, won many rosettes/certificates – was always pleased to win a ‘dog with waggiest tail’ certificate. The club has made a donation to Hospice at Home on behalf of our members in memory of Mary. She is remembered fondly, by many of our members.